Each frame is .1 second apart. In this race, Grant Hackett recorded a time of 14:48.33. The second place finisher was the reigning two-time 1500-m champion, Kieren Perkins. At these Games, biomechanists recorded every event and determined start times, turn-times (5m in and out), stroke rates and lengths, and swimming efficiency. It was found that for most laps in this race, the swimming velocity of Perkins was better than Hackett, but Perkins lost the race because of accumulated deficits due to his slow turns. Perkins' loss could be attributed to his wearing of a sleeved, neck-to-ankle bodysuit that restricted the range of movements in important aspects of the turning action. Perkins also did not perform his former trademark double-leg kick off the wall, an innovation that marked his early successes and world-record swims. Grant Hackett's stroke has changed little over the past four years (see and compare the analysis of his 1997 Pan Pacific Games swim). His times have changed little too. An underlying theme of this analysis is that for Hackett to improve, the mechanics of his left arm action will have to improve. Frame #1: The right arm is about halfway through its propulsive phase and the left arm enters. The hand/forearm-propelling surface of the right arm is positioned to provide an optimal amount of direct, horizontal force. The early entry is due to tall, long-limbed swimmers like Grant Hackett and Ian Thorpe taking much longer in the propulsive phase of a stroke than in the recovery of the opposite arm. This frame illustrates the swimmer "parking" the left arm until the propulsive effectiveness of the right arm is complete. The right leg kicks to counterbalance the vertical forces created by the left arm entry. Frame #2: Right arm propulsion continues with force emanating from the hand/forearm surface. The head turns to the right to breathe. The left arm remains "parked" long in front in a horizontal position where it will develop the least resistance. Frame #3: The right arm initiates the exit by extending backward and rounding upward. The left leg performs an abbreviated kick to partially counterbalance vertical forces created by the exiting right arm. The remaining counterbalancing force comes from the left arm beginning to press downward. This frame illustrates Hackett's superb streamline, a feature that has always marked his crawl stroke swimming. The head is turned to the right. Frame #4: The left arm presses almost directly downward. The right arm is well into the recovery. It is possible that the downward press counterbalances the recovery. Propulsive forces are not being generated at this stage. Inhalation begins. Frame #5: The left arm presses downward and slightly to the side. This coincides with the recovering arm being at its highest and widest position. Both lateral and vertical forces need to be counterbalanced. Since the left arm should also be initiating propulsion, its vertical force component is likely to be more than needed for counterbalancing the recovering right arm and so a further counterbalancing movement is needed by a left-leg kick. The stream of the "drag pocket" coming off the hand and forearm shows that the left arm's forces are primarily opposite forward motion. Inhalation is finishing and the face begins to return into the water. Frame #6: The left-arm downward-press continues and still does not provide substantial propulsion. Any propulsive force that is generated will be virtually insignificant and comes from a small part of a minor lift force created distally over the left hand. That lift force is at right angles to the drag force. Right arm recovery is near completion. The head continues to turn. The left leg remains down, acting like a rudder to keep the body streamlined by counterbalancing the left arm vertical force component. It is this phase of the stroke, the initiation of the left arm action, that Grant Hackett needs to improve to swim faster times over 1500m. The movements executed by the right arm in the early pull need to matched by those of the left arm. If that is done, the left arm will create earlier, greater, and more direct propulsive forces. Accumulated over a race of 200m or longer, the benefits of that change will be very substantial. Frame #7: The left arm now changes its effect. The elbow bends and upper arm adduction increases. The drag-pocket is now repositioned showing substantial vertical and horizontal forces components. Effective propulsion has commenced. The head continues to return (see the drag pocket trailing to the right off the face). Frame #8: The right arm enters bent and led by the fingers. The left arm repositions the hand/forearm-propelling surface more effectively by bending further at the elbow. Power is delivered by increased adduction of the left upper arm. The head is fully turned. The left leg kicks to counterbalance the right arm's entry. Frame #9: The increased force of the left arm pull is very evident. The drag pocket trails the hand/forearm and the amount of adduction is close to maximal for the stroke. The "parked" right arm begins to straighten to minimize its frontal resistance. Frame #10: The left-arm propulsive movement begins to enter the extension and "round-out" stage. The continued excellent streamline of the swimmer is demonstrated in this frame. Frame #11: The right leg kicks to counterbalance the vertical forces created by the exiting left arm. 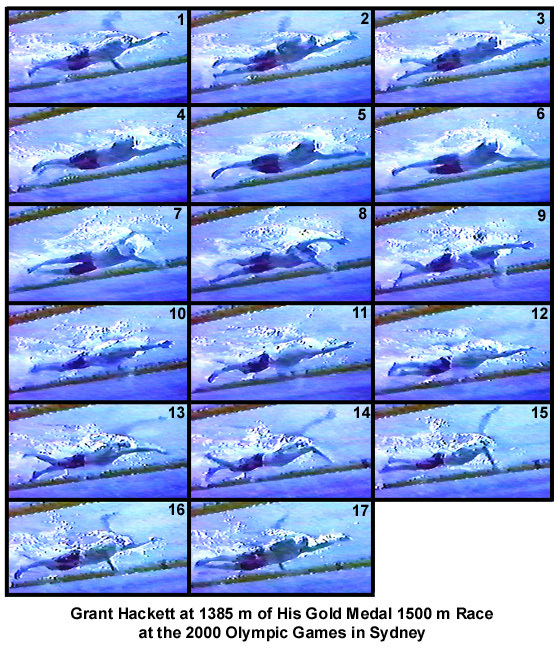 Frame #12: As the left arm clears the water, the swimmer rotates slightly to the right. Frame #13: An excellent repositioning action of the right arm begins. The elbow flexes, the upper arm medially rotates, and the shoulder extends fully forward. A slight, but momentary, wrist flexion occurs. The left leg kicks to counterbalance vertical forces created by this repositioning, which still retards the swimmer slightly because of the drag forces created by its movement pattern. Frame #14: The classic maximally forward "high-elbow" position is demonstrated in this frame. Propelling forces are created by the hand/forearm surface. The wrist has straightened to align the hand and forearm surfaces. Only a minor amount of adduction of the upper arm has occurred to this stage. The swimmer has wisely opted to achieve a propelling position and then to power that position with a full range of adduction. Frame #15: The propelling surface is now aligned to exert maximal propulsive force. Upper arm adduction occurs rapidly. This, and the previous frame, are worthy examples of how to perform this crawl stroke movement perfectly. Frames #16 and #17: The positions of frame #1 and #2 are virtually repeated. Grant Hackett exhibits excellent streamlining, a classic high-elbow action with his right arm, and the nuances of stroke "parking", a necessity that befalls a swimmer of his physical stature. It remains to be seen if he ever improves the important initiation phase of his left arm pull.